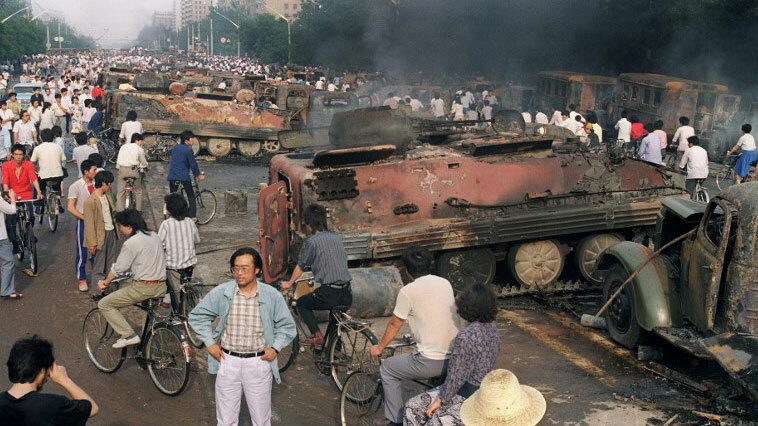 File photo of the aftermath of the military crackdown on pro-democracy protests at Tiananmen Square, June 4, 1989. As we mourn Liu Xiaobo, who died at age 61 on July 13, many will remember him mainly for his calls for democracy and an end to one-party rule in China, which brought him an 11-year prison sentence. Liu was already known as China’s most prominent dissident, when in 2008 he helped to draft Charter 08, a citizens’ manifesto signed by more than 12,000 Chinese intellectuals and human rights activists. Liu was sent to prison in 2009 on charges of “inciting subversion,” and in 2010 he was awarded the Nobel Peace Prize. But it’s also important to remember the role he played in negotiating a truce between student protesters and the Chinese army at Beijing’s Tiananmen Square on the night of June 3-4, 1989. Before midnight on June 3, the Chinese People’s Liberation Army had already killed dozens if not hundreds of Chinese civilians as its troops drove through crowds of protesters to reach the square. With students arguing among themselves whether to leave Tiananmen Square or die there, Liu and three colleagues maintained a semblance of order on the square and negotiated a truce with two PLA officers that allowed hundreds of students to safely escape. I was The Washington Post’s Beijing bureau chief at the time. Plainclothes police dragged away the one of the two American reporters who were working with me on the square, kicked him repeatedly in the head, threw him into an unmarked car, and detained him. A friend had called me at around 10:30 p.m. to report that PLA soldiers several miles to the west of Tiananmen Square had begun opening fire. They had killed stone-throwing civilian protesters who were resisting their advance toward the square. Robin Munro, a human rights activist whom I knew, was one of the few foreigners left on the square when troops, tanks, and armored personnel carriers arrived at its northern side. Munro watched as Liu Xiaobo and three colleagues decided to reach out to the military and tried to establish order. In April 1989, Liu Xiaobo was a visiting scholar at Columbia University in New York City, and he felt that he must go to Beijing and support the students. He didn’t want to follow the path of many Chinese scholars, who, as he described it, loved to talk but always failed to act. By the time Liu arrived in Beijing the situation had grown more serious. Chinese sources with government connections told me that Deng Xiaoping, China’s paramount leader, had decided that the Communist Party had been too lenient with the students. On June 2, Liu Xiaobo and three friends--Gao Xin, Hou Dejian, and Zhou Duo—launched a three-day hunger strike to demonstrate their willingness to sacrifice for the students’ prodemocracy cause. I and other reporters could confirm the truth of that statement based on our daily and often nightly trips to the square and areas near it. We estimated that crowds numbering more than a million altogether had gathered to support the student protesters. Despite the government’s allegation that the students had created “turmoil,” I had never seen Beijing citizens in such a friendly mood. The crime rate even appeared to go down. It was so peaceful that my wife Muriel was able to go out each day and shoot video of the protesters, often pushing along our 15-month-old daughter in a baby carriage. But that tenuous peace reigned up until the evening of June 3, with the army blocked by crowds of civilians, who were urging the soldiers not to shoot at the protesters. Throngs of citizens surrounding troops of the 27th Army and other soldiers at half a dozen intersections around Beijing were in a festive mood. Many couldn’t believe that the troops would open fire. But Liu Xiaobo and his three friends felt that the students remaining on Tiananmen Square faced a real threat of being killed or wounded if they stayed there. In the final predawn hours, the four went among the crowd, persuading demonstrators to surrender sticks, chains, and bottles, arguing with them that resistance was futile. Hou Dejian, a rock-star singer, and Zhou Dou, an economist, walked forward to the northern edge of the square, where they met with two officers, who identified themselves only as Commissar Ji and Commissar Gu. After checking with their superiors, the officers laid down an ultimatum: The students and their civilian supporters had to leave unconditionally via the southeastern corner of the square, which had been left open. Fortunately, students and supporters made it off the square, although some were later killed in confrontations with the troops once they headed west and north. In his introduction to a book of selected essays and poems written by Liu Xiaobo titled No Enemies, No Hatred, China expert Perry Link says that it’s impossible to say how many lives were saved by the compromise that Liu and his colleagues negotiated with the military. I think it’s safe to say that it was in the hundreds. The authorities arrested Liu for the role he had played at Tiananmen, accused him of being a “black hand behind a counterrevolutionary riot,” and sent him to prison for more than a year and a half. Liu also showed great courage in the way he dealt with Charter 08. As Link points out, the idea for Charter 08 didn’t originate with Liu, but when he began helping with it, his efforts were crucial. As Link also notes, “the courage of Liu Xiaobo from the 1990s on cannot be separated from his wife Liu Xia,” a poet and photographer to whom Liu Xiaobo dedicated many poems. Liu Xia has been kept under house arrest and police surveillance in recent years, cut off from contact with the outside world. But she never wavered in her support for Liu Xiaobo, who considered her an inspiration and spiritual companion. Dan Southerland is RFA’s founding executive editor. I predict that one day 4th June 1989 will be publicly commemorated in China, and that Liu Xiao Bo will be admired and celebrated by millions of his countrymen who presently have either a distorted impression of him or know nothing of him at all. Thanks to Liu Xiao Bo and a few others the embers of 4th June are still burning. Only when those embers burn brightly again will China fulfil its inevitable destiny.